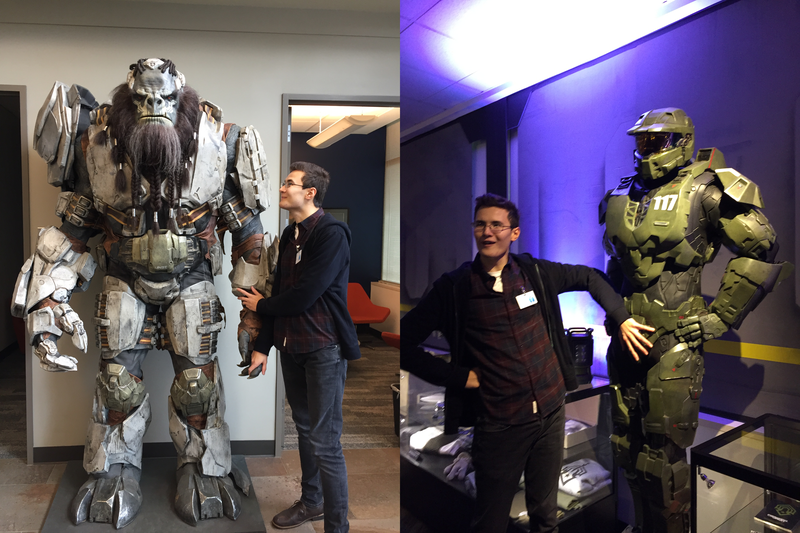 In the summer of 2016, I received an offer to fly out to Seattle and visit 343 Industries. As it turned out, my calendar was free… two-and-a-half years later. 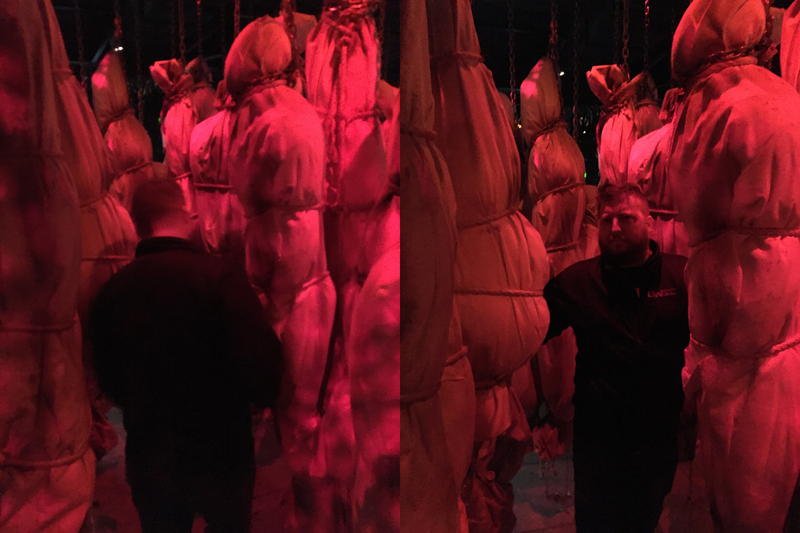 Anyway, herein lies my account of the trip with plenty of flattering pictures – particularly of myself and Grim – of the various shenanigans that ensued over the previous week. Pictured below is, perhaps, the most concise summary I can offer. I flew to Seattle from London on November 3rd, catching the plane at 10am and arriving in the US at about 1pm after a nine hour flight. It was a long ‘morning’, but that’s time travel for you. Fortunately, my sleeping pattern is already a mess which meant that I skipped the jetlag altogether. 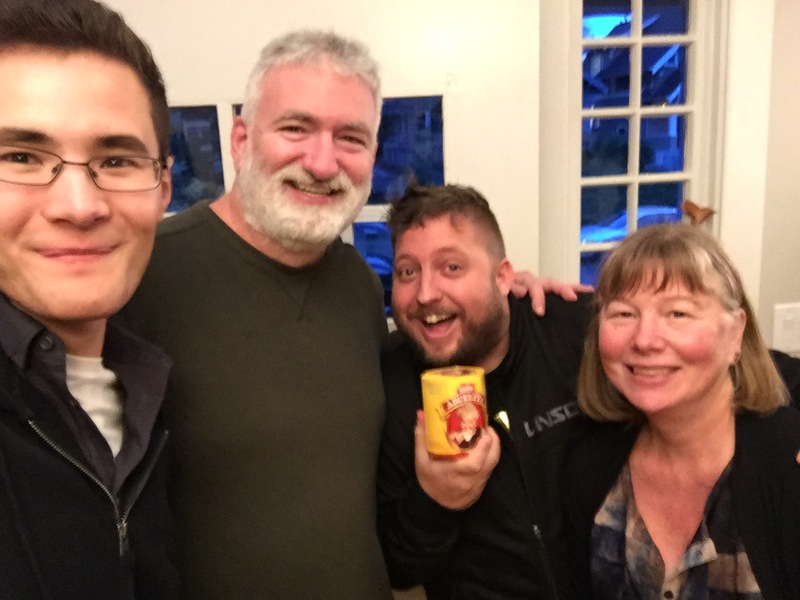 After settling in at my hotel, which was located just five minutes away from the Space Needle, I met up with the one and only Jeff Easterling – our own GrimBrother One – who was my companion and guide for the duration of my stay. I did, in fact, manage to snap an image or two of him in his new office. Don’t tell anyone! Just kidding (or am I? ), this was our visit to the Museum of Popular Culture (MoPop), which started the trip off. There’s no way to conduct a ‘getting to know you’ meeting quite like two nerds wandering through the halls of a Domain where every exhibit is a talking point. Whether it’s the props of bubble-shaped sci-fi guns of the 60s; the life-size models, which included Daleks, Cybermen, Xenomorphs, Sarris (from Galaxy Quest), Inigo Montoya, and so on; or the indie gaming and music sections, there’s something for everyone to get excited about and I recommend you pay a visit there if you find yourself in Seattle. 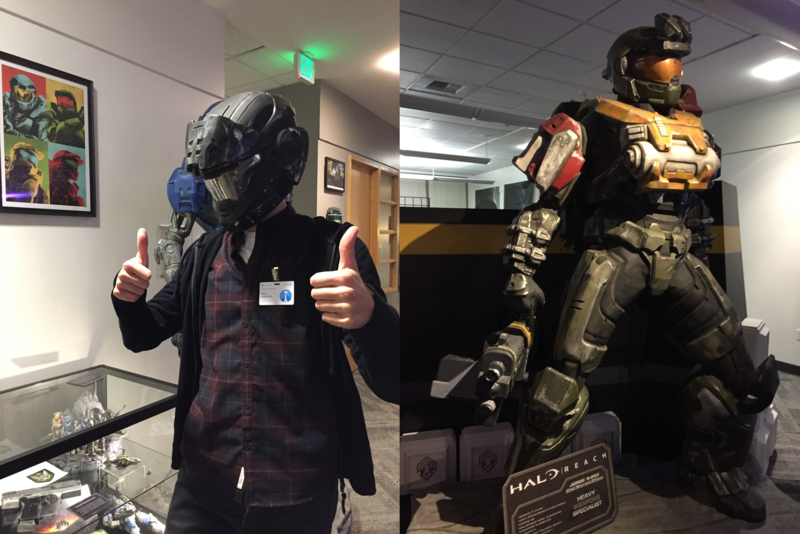 Following this, we went to visit a Halo community legend. Perhaps it would be more accurate to say the community legend, as he has been historically known as the ‘godfather’ of the Halo community. For those who aren’t familiar with him, Claude is the founder of Halo.Bungie.Org (HBO) – a fan-site spanning almost two decades, which was the place to go for Halo news and community content. If you open up your copy of Halo: Primordium, you’ll see the book is dedicated to him. Or, you might have a copy of Conversations From The Universe to dust off your shelf, within which is a UNSC Marine – Corporal C. Errera. We were generously and graciously invited into their home for a chat before heading out to dinner. I had been suffering from food poisoning the previous week, which felt about as pleasant as being subjected to the Shaping Sickness, so I was ready to eat until I physically couldn’t take any more. What I can tell you though is that we went to get ice cream afterwards and I managed to get chocolate smeared over a good portion of my face without noticing. Apparently Jeff didn’t notice either, as he neglected to point it out. And so I returned to my hotel, taking the elevator up to my floor with three other people who I sensed giving me odd sideways glances. It wasn’t until I got into my hotel room that I saw what the damage was. How embarrassing. I had much of the second day to myself, aside from the morning and evening where I found myself, once again, in Jeff’s marvellous company. I used my free time to explore the Marvel exhibit back at MoPop, visit the Space Needle, and take pictures of some Precursor architecture at the Chihuly Garden and Glass museum. But it’s the following couple of days you really want me to talk about, isn’t it? 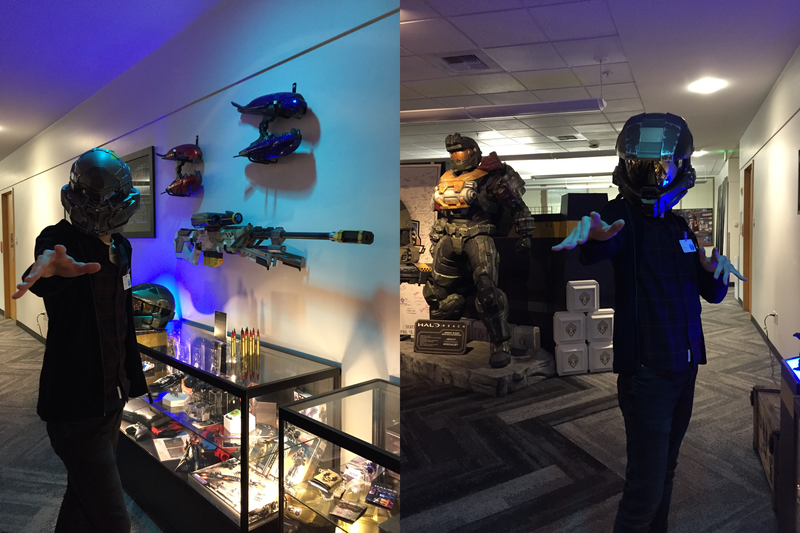 In what was either some great cosmic coincidence or a synchron – according to Forerunner legend, points in time that draw great forces together – I just so happened to visit 343 Industries on November 6th. There I was, standing in the lobby. 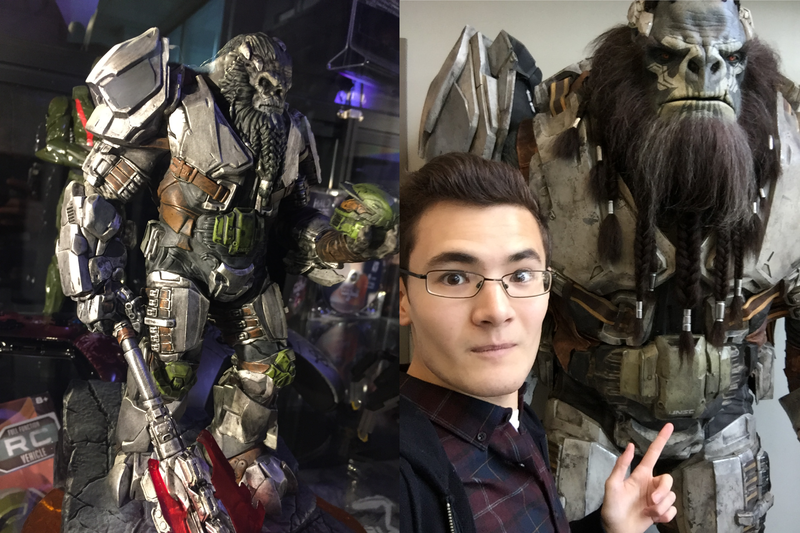 The Master Chief and Jameson Locke (in a much larger version of the statue included with the Limited Collector’s Edition of Halo 5) flank my left, Atriox on my right. 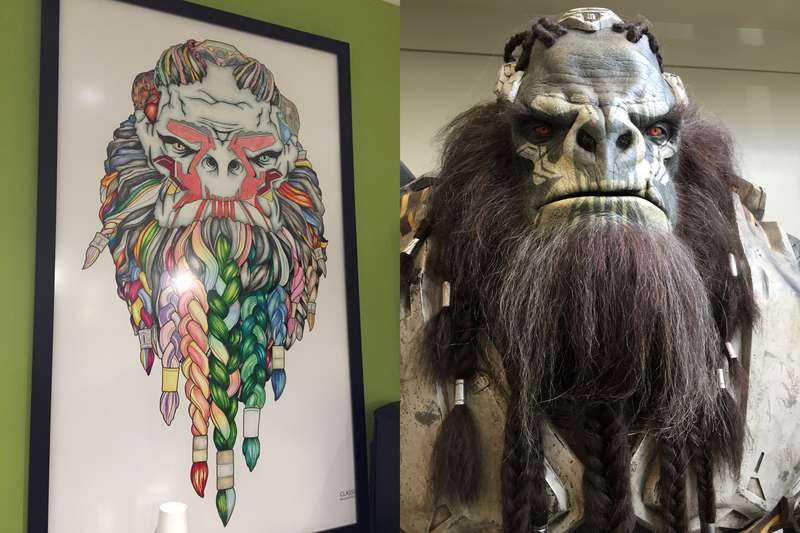 Sadly, Atriox wasn’t wearing his tie – but as you can see from the header image we got along wonderfully! I met with Jeff, Ken Peters, Rob (Synth Samurai), and John (Unyshek) for an on-site lunch where we got chatting about smoothing out technical issues with various ships in the Halo universe, some stuff about Halo 4 and the Ur-Didact, ruminations about the old Catalog forum posts, and so on. Uny took the opportunity (as I’m sure he often does) to ‘prototype’ some of his Terrible Joke Tuesday ideas, much to Ken’s chagrin. Back in the studio, we ran into Paul Crocker – the narrative director for Halo Infinite – who I managed to have a quick chat with about the work he’s doing and the approach they’re taking with this new game. Regrettably, the Domain has suppressed the details of this information. What I can say is that I am intrigued and excited. After that, it was time to visit the museum. I’ve seen it in videos before, and while that definitely gives you a sense of the place… there’s nothing quite like walking into this living archive of this seventeen year old franchise. It was even more impactful because I was the only one in there. The feeling can perhaps best be likened to the first time you jump into Forge and you soak in just how extensive your playground is. 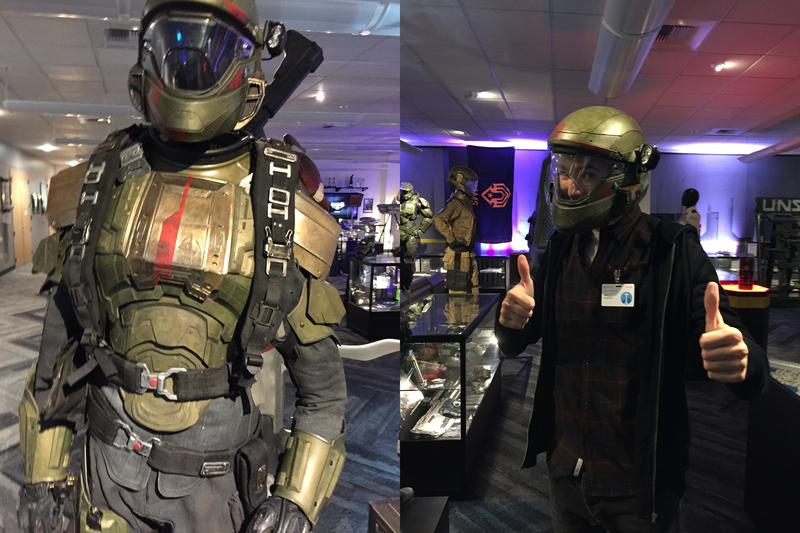 Suffice to say: I tried on every helmet I could get my hands on, picked up every weapon prop and replica, and took pictures of everything (at least, the stuff I was allowed to – *wink*). Jeff and I were soon joined by the apparently elusive Jeremy Patenaude, who I got to hyperventilate with over discussion of Forerunners, Kelly Gay’s upcoming Halo: Renegades, and how his work on the old Ascendant Justice blog very much inspired me with my own work. And then came the incomparable Kiki Wolfkill, Nicolas ‘Sparth’ Bouvier, Sarah Campbell, and Scott Jobe. Kiki and Scott were keen to talk to me about my articles on Halo: Nightfall, Rise of Atriox, and Collateral Damage, followed by a long and productive chat about getting into the gaming industry. They all provided a great deal of insight into the nuances of what the work really entails for an aspiring professional writer. It’s a conversation I was extremely privileged and grateful to have with such respected, experienced, and down-to-earth folks. Later on, I got to play through the entirety of Halo: Fireteam Raven with Jeff and Sarah which was an awesome experience. Jeff and Sarah can definitely attest to my gleeful reaction from start-to-finish over all its neat little details and how well it ties in with Halo 1. It’s one of those stories that adds an extra bit of weight to one’s appreciation for Halo 1, but it’s not essential to the experience – the writing captures a perfect middleground that rewards those who are invested in the lore while also presenting a very straightforward story that you can just pick up and play. In a lot of ways, it feels like a ‘greatest hits of Halo’ with its wide-ranging use of weapons, vehicles, and music from across the franchise. Not to mention the impressive scale of some of the set-pieces, particularly towards the end. It took me back to some of the large-scale vehicular combat that was teased in Halo: Reach (at the start of Tip of the Spear). Should you find yourself in a Dave & Buster’s store, or some place where Fireteam Raven is available, it’s definitely worth your time. Sadly, despite being essentially a one-man fireteam on his side of the screen, Jeff and Sarah wiped the floor with me when it came to the scoreboard. One would almost think they’d had practice! 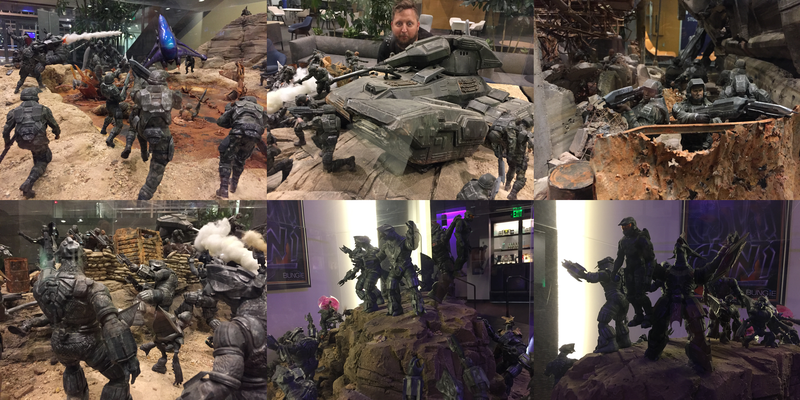 Next stop was Studio D over at the main Microsoft campus in Redmond where most of the Believe diorama – from the unforgettable marketing campaign of Halo 3 – is located. I say “most of” because part of it is at 343 and another part (the centrepiece, really, with the Chief being held aloft) is at Bungie. Like the museum, seeing this in person is something else! The level of detail is astonishing, there isn’t a single part of it left without something going on – without some story being told. 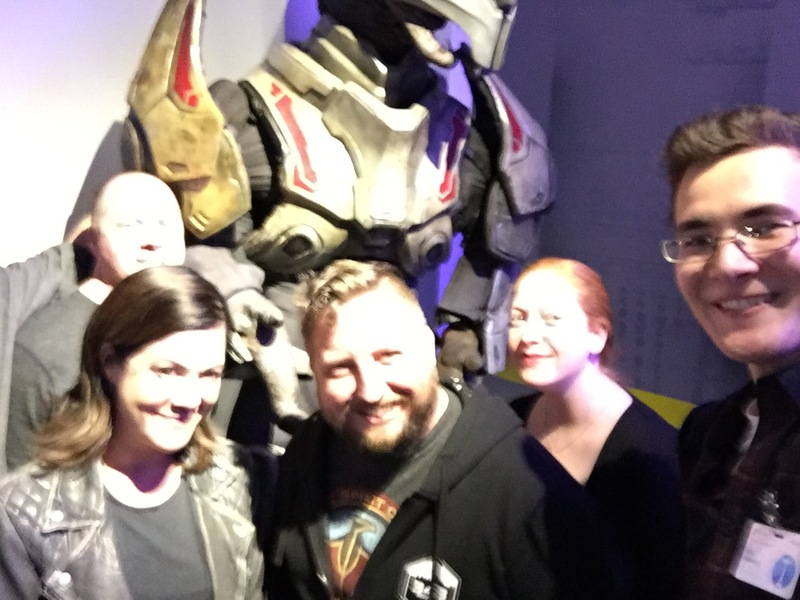 And yes, I visited Bungie as well! DeeJ, who celebrated his seventh year at Bungie on the day of my visit, very kindly arranged for Cozmo to give me the full studio tour. My journey with Destiny has been an interesting one. On this blog, you’ll find only my very mixed first impressions of the original game back around the time of the beta in 2014, but I’ve not written anything on it since. That gives a rather false impression, as my perspective did a complete turn-around when House of Wolves released. That is where I felt Destiny began to really seize its potential to become something great and I’ve been hooked ever since. From what I saw (and I am only allowed to share a few things), everyone there is hard at work to make the game the best it can be. That cannot be understated, really. It’s a perspective that we, as fans, really lack until you come into contact with the people and see them with their heads buried in their work – the same sentiment goes for my experience at 343. More humanity goes into the production of games than the average fan ever gets to see. There are always going to be things we dislike, directions we vehemently disagree with, but it’s always worth trying to broaden our perspectives to allow for that understanding. I didn’t want to leave Seattle. I really didn’t! 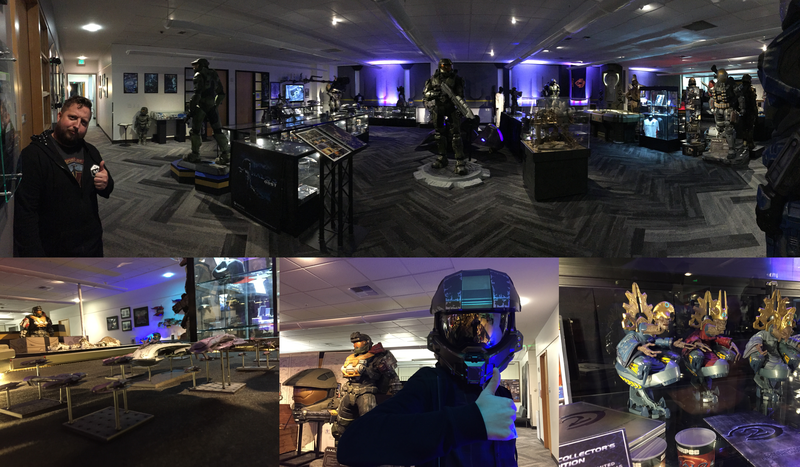 The atmosphere at 343, Bungie, and Microsoft – the studio culture, which I got the barest glimpse of – was inspiring and infectiously positive. I’m immensely grateful for how welcoming and accommodating everybody was. I am slightly less grateful that Jeff did not help me out with the last bit of crispy chicken when we were completely stuffed during our last meal, but I’m a forgiving person so I’ll let that one slide. Really, after two-and-a-half years of waiting for my calendar to free up, I couldn’t have gone at a better time. Coming away from this now, I feel a renewed sense of faith in things I wasn’t so certain of before, a broader sense of perspective for things that I did not know (which I will be ruminating on in due course), and excitement for what lies ahead – both for these franchises, but also the direction my own career is headed in the near-future. In the meantime, I leave you with some more pictures of this unforgettable trip. The ‘B’ in LGBT stands for Banished. This is the armour and helmet worn by Mike Colter! Future 343 visitors, take note: Rob is the guy to go to for good teriyaki places! Three incredible art prints I received from Sarah Campbell, whose artistic talent and general awesomeness knows no bounds (my phone camera cannot do their quality justice). This coming Saturday will see The Five Untold Stories of Halo 5 resume, of which there are three stories left to go, and then I have a very important, very personal rumination on Halo 5 coming after that – so there’s lots of content to come over the next few weeks.